During my younger son's spring break, we went to Washington, D.C. When we planned the trip, the assumed we would be arriving earlier than the peak for the Cherry Blossoms, but because of our odd weather in early 2012, the peak was early, and we hit it exactly. It was a beautiful trip! We had a gorgeous day to walk around and enjoy the trees. This is a beautiful yarn that I skipped the first time (yes, I visited the store twice), and then went back for. It is dyed by a local company -- Neighborhood Fiber Co. It is the colorway Georgetown and is a rich, deep blue. It is a superwash merino, worsted weight. 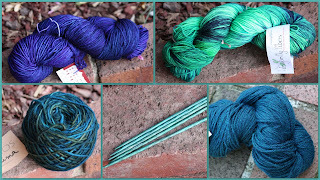 The next yarn is a sock yarn by Dragonfly Fibers. It's bright greens and dark blues -- beautiful colors. It is called Djinni Sock in the colorway Weather Girl. 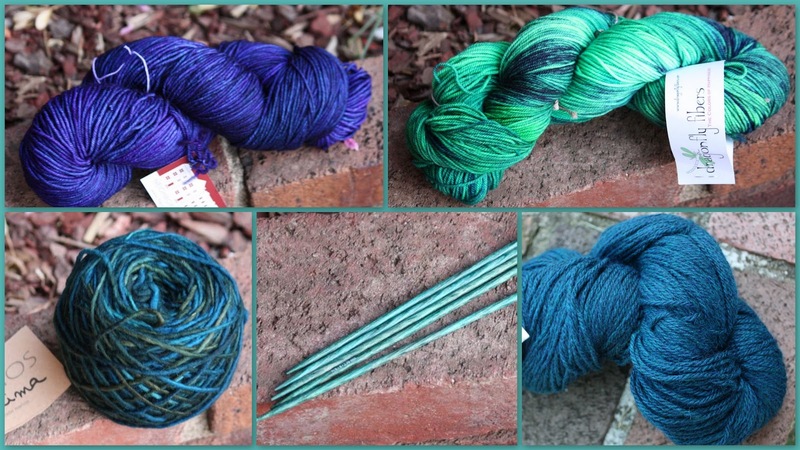 The next yarn appealed to me solely because of its color, which is a warm, heathery teal, edging toward blue. It's Berroco Vintage DK, half acrylic, 40% wool and 10% nylon. The next image is of a set of needles I bought. I can't remember the brand now, but each size is a different color. These are US size 4 DPN. Pretty. The last yarn is Manos del Uruguay Maxima, an extrafine merino wool, kettle dyed, worsted weight. It's a blend of deep greens.